Coach/Mentors teach and mentor individuals in learning HeartMath’s self-regulation skills. Using a coaching style, they help them to apply and master the new skill set in their day-to-day lives. As your clients build their resilience capacity, they reduce stress and have increased energy to do the things that matter most to them. HeartMath’s Coach/Mentor Certification Program enables you to offer new, current and past clients or small groups the Building Personal Resilience (BPR) program. The Coach/Mentor Certification Program is offered in a series of eight live, two-hour phone-based classes. This interactive program is taught by a HeartMath master instructor. Over the course of your training, you will have the opportunity to mentor and coach two individuals of your choosing. Course materials include a copy of Building Personal Resilience – A Handbook for HeartMath Coaches and Mentors and three Building Personal Resilience Guides: one for you to develop your own understanding and practice; and one for each of the two individuals you are working with in your practice sessions. There will be ample opportunity to ask all of your questions. The primary objective of Building Personal Resilience is to provide strategies that encourage and support an effective and sustainable practice of HeartMath’s resilience-building and energy self-regulation skills. Once certified, you will be able to provide any or all of the Building Personal Resilience content to those you mentor/coach, based on their particular needs. Certification allows you to work one on one with individuals anywhere in the world. The mentoring/coaching methods you will learn and the content you will teach incorporate many years of research and best practices developed with diverse populations worldwide. Although most of those with whom you will work will require only four sessions to learn and apply the basic resilience-building and energy self-regulation skills, you’ll always have the option of providing additional sessions to those who desire more benefits and/or to ensure long-term retention of these skills. Click here for HeartMath Coach/Mentor FAQs. Click here for HeartMath Coach/Mentor Application. 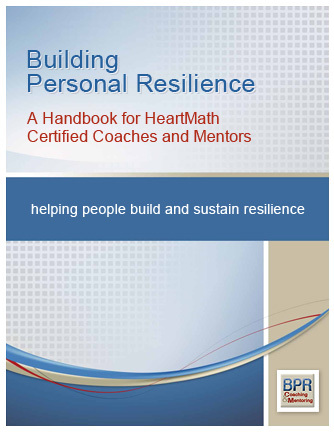 Click here to download a sample of Building Personal Resilience – A Handbook for HeartMath Certified Coaches and Mentors. A license that allows for the commercial use of HeartMath’s intellectual property so you can promote yourself as a HeartMath trained professional. Instruction on how to teach the research and science behind the HeartMath System. Instruction on how to teach six core HeartMath tools and techniques and to use emWave® and Inner Balance™ technology products. Support on how to integrate the HeartMath System into your other professional services. 20-30% discount all HeartMath products in our store. Membership in HeartMath’s coach/mentor network for continuing education and ongoing support. Assisting them in identifying goals. Helping to expand their awareness and identifying primary sources of stress that cause energy drains. Providing strategies that help them find their own solutions. Helping develop a plan to integrate the resilience-building skills in their daily routines and offering objective feedback. Ensuring that they stick to their practice plans and are able to achieve sustainable results. 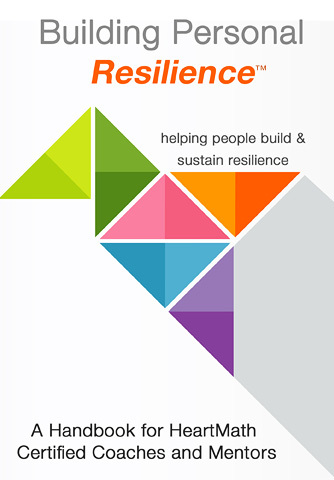 Support materials include the Personal Resilience Coach/Mentor Handbook and three Building Personal Resilience Guides: one for you to develop your own understanding and practice; and one for each of the two individuals whom you coach/mentor. You also will have access to our online Resource Center, where you can review past classes and access an extensive e-library of instructional aides and handouts to build your business and work with clients. All classes are 2 hrs in length. Independent License – You or your organization charges a fee for your services: $1,495. Organizational License – You or your organization doesn’t charge a fee for your services: $1,295. Shipping charges for course materials are not included in the cost. Complete the non-binding application form and click the “submit application” button. You will receive an immediate confirmation e-mail that you will be contacted to set up a call with a HeartMath representative. Participate in a 15- 20-minute phone interview to address your questions and explain program logistics. Upon completion of the interview and approval you may enroll in the program. Afterward, you will receive your confirmation package and training material. Building Personal Resilience Certification (Independent) is rated 4.7 out of 5 by 203. Rated 5 out of 5 by Rinzabraveheart from Great intro and training This little book and training packs a lot of information. There's enough science to explain but not overwhelm, description of techniques and tools to begin developing a daily practice and coach. A great place to jump in! Rated 5 out of 5 by LANE from Absolutedly Wonderful I cant say enough about how much it has benefited my life.The practice of the teachings has truly infused every aspect of my life for the better .I just seem to enjoy my life so much more and I know that I have become a better person to be around and I like that very much. Rated 2 out of 5 by Student from Not what expected This is not what I expected. The sessions were 3 hours, once a week for 8 weeks. It was too long did not offer the value I expected. Rated 4 out of 5 by Quique from Amazing, heartfelt experience Love the training program!! please enhnace or upgrade to more efficient Interface Platforms to improve interconectivity. Thanks a lot! Rated 5 out of 5 by Antoinette from Keeps what it promises A professionally structured online training with wonderful tools that make a difference in the life of others. Dedicated staff, great material, lots of resources available once certified. Highly recommended. Rated 5 out of 5 by Alex from Indispensable skills! Valuable training that should be a must for everyone willing to make a positive difference in this world. Techniques taught are simple yet incredibly powerful. Highly recommended. Rated 5 out of 5 by Carla from Life Changing when in coherence with life. Heartmath is a perfect tool for those that are suffering from anxiety, depression and just plain life. Coherency is a way of life that can be achieved through the tools given to our clients. Rated 5 out of 5 by Daniel from Truly amazing It's incredible how the heart works. The connection I have gotten with my higher self, for decision making, reducing stress, even for sleeping at night. I truly know now that the heart is where all the magic happens. I am very grateful.